Disneyland Paris is arguably one of the most stunning parks in the world. Though it took many years for the park to gain its stride, the resort is now one of the highest visited attractions in all of Europe. As beautiful and ingenious as the design is, it’s hardly a true original. All of the plans are modifications of the original Disneyland that opened in California back in 1955. If you’re looking for true originality in France, you need to travel south from Paris to a city called Poitiers and visit Futuroscope. Adrenaline junkies looking for the latest roller coaster or drop tower or spin n’ puke will be extremely disappointed to learn that this park has zero of those types of attractions. Futuroscope is primarily a park with multimedia attractions that use 3-D technology to transport visitors into another place. Upon first glance, the most striking element of the park is its architecture – it doesn’t even look like a theme park. In 1984, when Futuroscope was being designed, a 35-year-old architect named Denis Laming submitted several proposals of what the buildings in the park could look like. 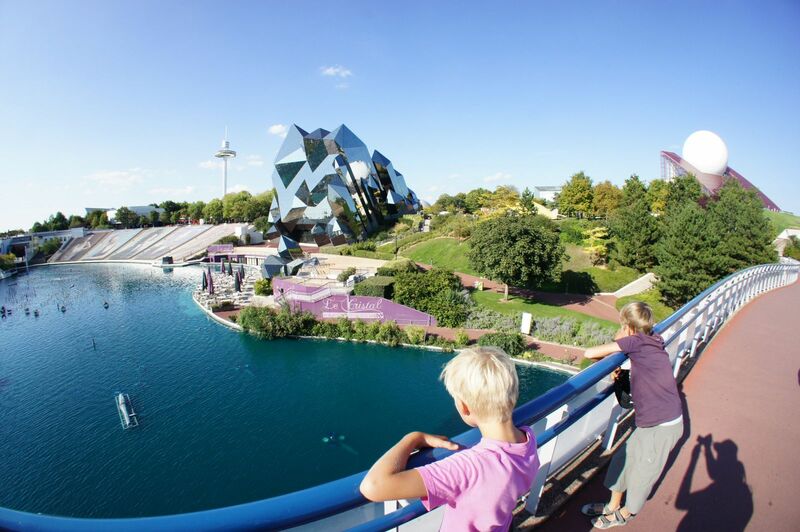 His bold vision sold Rene Monory, the founder of Futuroscope and Laming, who has been the head architect ever since, designing every building within the gates. 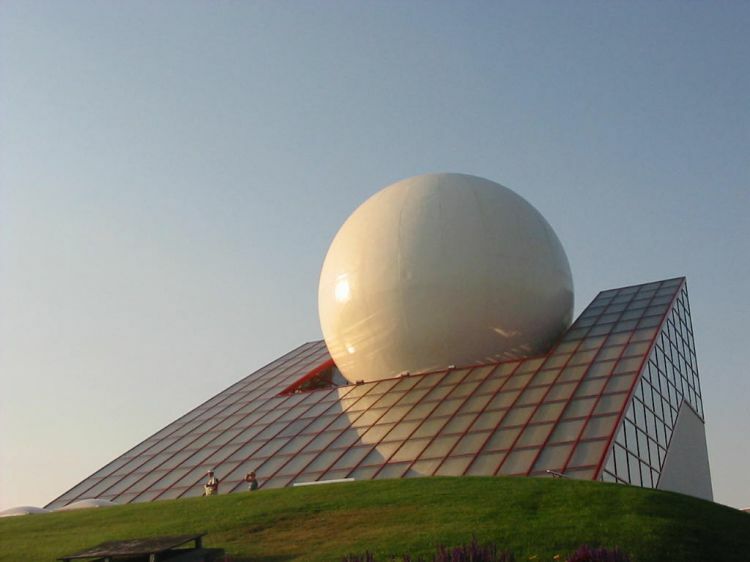 The Futuroscope Digital City was the first building designed by Laming that was constructed for the park. The shape of the building mimics the sun rising over the horizon. His vision was the building would convey a sense that time and space are inseparable from life. 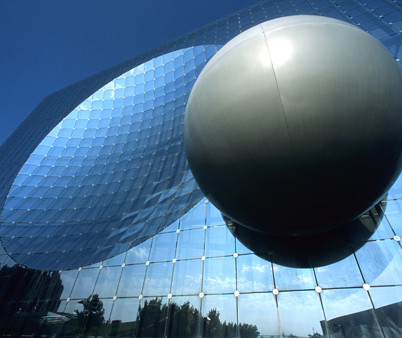 Futuroscope’s flagship building is named Kinemax. The rock crystals thrusting from the ground are made up of 3,000 reflective glass plates that cover a total surface area of 45,750 feet! This building houses the park’s IMAX 3D movies and is intentionally designed as an optical illusion for picture taking. 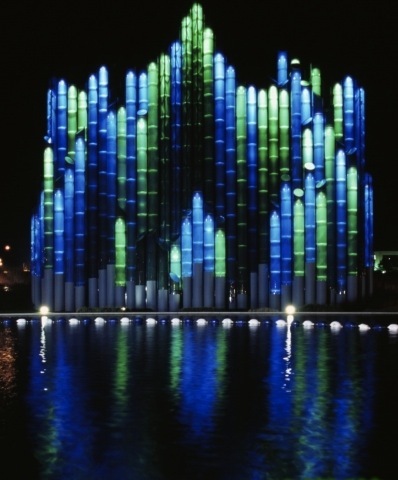 Denis Laming created the structure to represent a giant screen as well as a lens that distorts the flat image. The result is a reflection that is an inverted image of the planet. However, the architecture is only one element that makes this park truly unique. Think eating around World Showcase at Epcot is exotic and daring? This place features dozens of one-of-a-kind dishes that have never been sold to regular theme park guests before. Molecular cuisine is a new dining experience craze that is slowly creeping into fancy eateries around the globe, but never in a theme park until now. By definition, molecular cuisine is merely the chemical and physical reaction of the properties of food when it’s stirred and cooked. For example, when you cook a steak or pour lemon juice on a half-eaten apple, you are changing its molecular make up. Thus, the taste, texture and even flavor of the food become altered as a result. Who said Theme Park University wasn’t educational? However, cooking a steak isn’t exactly cutting edge or exciting. 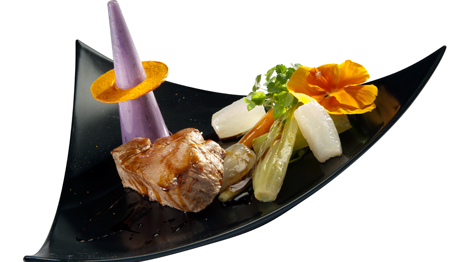 Eating at Futuroscope’s signature dining location, Le Cristal, is anything but boring. 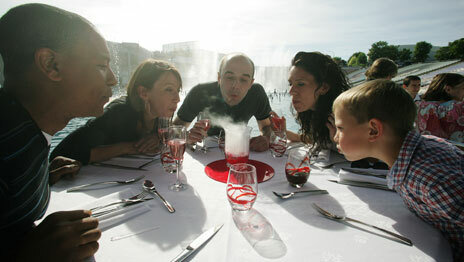 The staff at the restaurant use techniques like dry ice to create a visual showpiece that is not only unique to a theme park dining experience, but tasty as well. Another unique experience at this dining establishment is eating certain foods blindfolded. The idea is to take a normal theme park dining experience including everything you know about typical amusement park food and throw it out the window. 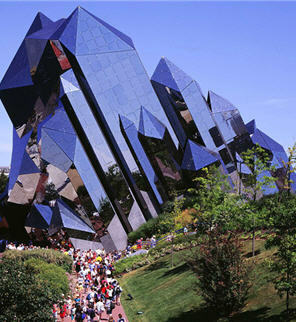 Le Cristal is definitely not for picky eaters, but is far from the most adventurous dining experience in Futuroscope. Aerobar may be the most daring dining experience in a theme park on the planet. A 12-passenger basket takes diners 115 feet up into the air while a bartender serves the patrons snacks, sodas and cocktails. Each chair is equipped with a seat belt that is used to keep riders safe, as there is no floor to the basket – your feet dangle below you as you take in views of the entire park! While Aerobar could be classified as a dining location and a ride, it’s far from the only attraction the park has to offer. 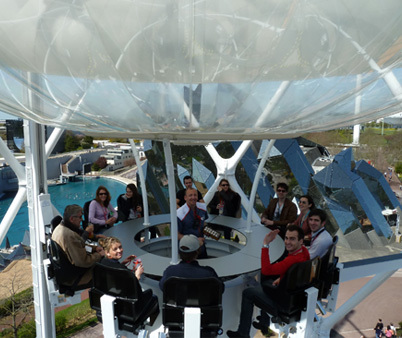 Come back to Theme Park University next time and I will discuss the history of the park as well the attraction – nearly every single one is a one-of-a-kind that can only be found at Futuroscope! To keep up with the latest that is going on at Theme Park University, follow us on Twitter by clicking here and like us on Facebook by clicking here! This entry was posted in International Parks, Theme Parks 101 and tagged Aerobar, Denis Laming, Disneyland paris, Futuroscope, Futuroscope Digital City, Le Cristal, molecular cuisine, Rene Monory, theme park architecture, theme park design, Theme Park University. Bookmark the permalink. Trackbacks are closed, but you can post a comment.